JPEG stands for Joint Photographic Experts Group. It is a standard method of compressing photographic images. We also call JPEG the file format which employs this compression. The file extensions for this format are .JPEG, .JFIF, .JPG, OR .JPE although .JPG is the most common on all platforms. JPEG/JFIF is mostly used for storing and transmitting photographs on the World Wide Web, but not as well suited for line drawings and other textual or iconic graphics because its compression method performs badly on these types of images. JPEG is at its best on photographs and paintings of realistic scenes with smooth variations of tone and color. The resulting compression ratio can be varied according to need by being more or less aggressive in the divisors used in the quantization phase. The JPEG committee has now created its own wavelet-based standard, JPEG 2000, which is intended to eventually supersede the original JPEG standard. 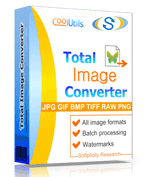 When you need to convert JPEG files to other formats like TIFF, PNG, BMP use Total Image Converter. It's the most powerful image converter to convert to and from JPEG.